This is a photograph that I took a few days ago during a walk at the Cummings Center Pond here in Beverly, MA. 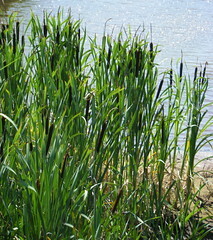 I liked the way the cat tails looked against the water, so I took a picture. Tonight I cropped the image to get this composition.